Base Rental shall be payable in advance on the first day of every calendar month. (a) The term "Building" shall mean _______________ located in the City of __________, __________ County, __________. (b) The term "Premises" shall mean the following portions of the Building on the floors indicated and being known as the Suites described below, as is more particularly outlined on the floor plans attached hereto as Exhibit "A". 1.5 Rentable Area of the Premises. The term "Rentable Area of the Premises" shall mean _________ square feet. 1.6 Security Deposit. Prior to the execution of this Lease, Tenant has paid to Landlord the sum of ____________ Dollars ($__________), as a Security Deposit. (a) The Rentable Area of the Building is _________ square feet. (b) The term "Tenant's Percentage Share" means ______________________ percent (______%). Landlord and Tenant acknowledge that Tenant's Percentage Share has been obtained by dividing the Rentable Area of the Premises by the Rentable Area of the Building, and multiplying such quotient by 100. (xv) The following taxes: (A) personal property taxes (attributable to the year in which paid) imposed upon the furniture, fixtures, machinery, equipment, apparatus, systems, and appurtenances used in connection with the Building for the operation thereof, and (B) real estate taxes, assessments, sewer rents, rates, and charges, transit taxes, taxes based upon the receipt of rent and any other federal, state, or local not including income or franchise taxes or any other taxes imposed upon or measured by Landlord's income or profits, unless the same shall be imposed in lieu of real estate taxes) which may now or hereafter be levied or assessed against the Building and the land underlying the Building or the rents derived from the Building (in the case of special taxes or assessments which may be payable in installments, only the amount of each installment paid during a calendar year shall be included in the taxes for that year). (e) The term "Base Operating Expenses" shall mean the Operating Expenses paid or incurred by Landlord in the Base Year. If the Building was not ninety-five percent (95%) occupied throughout the Base Year, then the Base Operating Expenses shall be an amount which fairly reflects what the Operating Expenses would have been had the Building been ninety-five percent (95%) occupied throughout the Base Year. (f) Expenses shall not include any penalties, fines, late charges, interest or any transfer, inheritance, profit or capital tax or levy, or any license fee of Landlord; nor shall such Expenses include repairs, restoration or other work occasioned by fire, windstorm or other casualty for which Landlord is reimbursed by insurance, expenses incurred in leasing or procuring tenants, leasing commissions, advertising expenses, expense for renovating space for new or existing tenants, legal expenses incident to enforcement by Landlord of the terms of any lease, interest or principal payments on any mortgage or other indebtedness of Landlord, general percentage overhead of Landlord, and wages or other compensation for employees above the grade of general business manager for the Building. (g) The annual statement for Operating Expenses shall contain a computation of Tenant's annual pro rata share of said Expenses and a certification as to the total floor area/gross leasable area of the Building. (h) Tenant shall be entitled to request such additional information as may be reasonably required in order to enable Tenant to confirm the adequacy and accuracy of the Operating Expenses and the calculation of Tenant's pro rata share thereof. 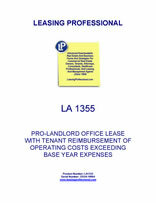 (i) Concerning the adjustment of Operating Expenses based upon a ninety-five percent (95%) occupancy level as set forth in subsection (b) of Paragraph 4.3, in no event shall the aggregate payments under this or similar provisions by all tenants in the building exceed the Operating Expenses actually incurred by the Landlord. 1.8 Lease Term. The Lease Term shall commence on _____________ (which shall be referred to herein as the "Commencement Date") and shall end at midnight on _____________ (which shall be referred to herein as the "Expiration Date"). Any partial months occurring at the beginning and/or the end of the Lease Term shall be added to, and shall be a part of, such Lease Term. 2.1 Premises. Landlord, in consideration of the covenants and agreements to be performed by Tenant, and upon and subject to the terms and conditions of this Lease, does hereby rent and lease unto Tenant, and Tenant does hereby rent and lease the Premises from Landlord for the Lease Term. This Lease shall create the relationship of landlord and tenant between Landlord and Tenant, and no other sort of relationship is created thereby. 2.2 Term. Tenant takes and accepts the Premises from Landlord in its present condition and as suited for the use intended by Tenant, except for such improvements as may be expressly provided for in the Tenant Improvement Agreement attached hereto and incorporated herein as Exhibit B. 2.3 Removal of Tenant's Personal Property. Before the termination of this Lease, Tenant shall remove from the Premises all its personal property which this Lease allows Tenant to remove and peaceably surrender all portions of the Premises and the keys thereto to Landlord in the same condition as each portion of the Premises existed at the time such portion was first occupied by Tenant under this Lease, only natural wear and tear, fire and casualty and acts of God excepted. Tenant shall have no right to remove any fixtures, improvements, or attached equipment from the Premises at the termination of this Lease, and said items shall be deemed the property of Landlord unless such items were installed by or at the request of Tenant and the Premises are restored to their original condition. Such property of Tenant as it fails to remove either from the Premises or the Building after the termination of this Lease shall be considered as abandoned by Tenant and may be disposed of by Landlord in any manner whatsoever without accounting to Tenant for same or being liable in any way to Tenant for such disposition. 2.4 Holding Over. In no event shall there be any renewal of this Lease by operation of law, and if Tenant remains in possession of the Premises after the termination of this Lease and without a new lease executed by Landlord and Tenant, Tenant shall be deemed to be occupying the premises as a Tenant at sufferance at an amount equal to two hundred percent (200%) of the Base Rental and additional rent provided for in this Lease and otherwise subject to all the covenants and provisions of this Lease insofar as the same are applicable to a month-to-month tenancy; provided, however, that during the first sixty (60) days of any such holdover, the aforesaid "two hundred percent (200%)" shall not be applicable and, in lieu thereof, the rate shall be "one hundred fifty percent (150%)" for such sixty (60) day period only. 3.1 Assignment and Subletting Procedures. (a) Tenant shall not, without the Landlord's prior written consent, (i) assign, convey, mortgage, pledge, encumber, or otherwise transfer (whether voluntarily, by operation of law, or otherwise) this Lease or any interest under it; (ii) allow any transfer thereof or any lien upon Tenant's interest by operation of law; (iii) sublet the Premises or any part thereof; and (iv) permit the use or occupancy of the Premises or any part thereof by anyone other than Tenant, and any attempt to consummate any of the foregoing without Landlord's consent shall be void. (b) Notwithstanding anything herein to the contrary, if at any time or from time to time during the Lease Term, Tenant desires to sublet the Premises or assign the Lease with respect to all or part of the Premises, Tenant shall notify Landlord in writing (hereinafter referred to in this Paragraph 3.1(b) as the "Notice") of the terms of the proposed subletting or assignment, the identity of the proposed assignee or sublessee, the area proposed to be sublet or covered by the assignment, and such other information as Landlord may request to evaluate Tenant's request to assign or sublet. Landlord shall then have the option either (i) to sublet from Tenant such space (hereinafter referred to as "Sublet Space") as provided in Paragraph 3.1(c) below; or (ii) to review such proposed assignment or sublease for approval as set forth in Paragraph 3.1(d) below. The option to sublet or to review, as the case may be, shall be exercisable by Landlord in writing within a period of thirty (30) calendar days after receipt of the Notice. (c) In the event Landlord exercises the option to sublet the Sublet Space provided under Paragraph 3.1(b)(i) above, then (i) Landlord shall sublet the Sublet Space at the same Base Rental and additional rent as Tenant would have received pursuant to the assignment or subletting set forth in said notice; and (ii) the term of the subletting from the Tenant to Landlord shall be the term set forth in the Notice (which shall not be longer than the then current Lease Term unless Landlord expressly agrees in writing that any extension or renewal option contained in this Lease will apply to such Sublet Space) and shall be on such terms and conditions as are contained in this Lease to the extent applicable, except that the Landlord shall have the right to further sublet the Sublet Space. (d) If Landlord fails to exercise either its option to sublet or its option to terminate the Lease as set forth above within the said thirty (30) day period or elects to review the proposed assignment or sublease for approval, Tenant shall submit to Landlord within twenty (20) calendar days after said period a copy of the proposed assignment or sublease and such additional information concerning the proposed assignee or sublessee, as may be requested by Landlord for Landlord's review. Landlord's approval of a proposed assignment or sublease pursuant to this subparagraph 3.1(d) shall not be unreasonably withheld or delayed so long as all other requirements of this Paragraph 3.1, including this subparagraph 3.1(d), are satisfied. Landlord shall have the right to withhold approval of any assignment or subletting (and Landlord shall be deemed to have acted reasonably in doing so) in the event Landlord determines in its sole and absolute discretion that such assignee or subtenant shall be detrimental to the integrity of the tenant base in the Building; that the business of such assignee or subtenant shall not be compatible with the businesses of other tenants in the Building; that the business of such assignee or subtenant would materially interfere with the operation of the Building or other tenants located therein; that such assignment or subletting would adversely affect the marketability of the remaining unoccupied portions of the Building; that such assignment or subletting would cause a violation by Landlord of its obligations under any other lease covering any portion of the Building; or that the use of the Premises by the proposed assignee or subtenant is not of a kind or quality which is typically located in first class buildings in metropolitan __________, __________. Landlord shall have the right to withhold approval of any assignment or subletting (and Landlord shall be deemed to have acted reasonably in doing so) in the event the proposed assignee or sublessee is then either (i) a tenant or occupant of the Building or buildings located adjacent thereto, or (ii) a party with whom Landlord is then in negotiations for space in the Building or for space in buildings adjacent to the Building. Further, Landlord shall have the right to withhold its approval of any assignment or subletting in the event Landlord determines that the net worth of such assignee or subtenant is an amount less than the greater of Tenant's net worth as of the date hereof or as of the date of such assignment or sublease. In no event whatsoever shall Tenant assign or sublet, or list, advertise or otherwise publicize in any way the availability of, all or any part of the Premises (for an assignment or sublet) at a rental rate which is less than the rate for which Landlord is then offering any other space in the Building. If Landlord consents to the terms of the proposed assignment or sublease and the proposed assignee or sublessee, but a fully executed counterpart of such assignment or sublease is not delivered to Landlord within sixty (60) calendar days after the date of Landlord's written approval, then Landlord's approval of the proposed assignment or sublease shall be deemed null and void and Tenant shall subsequently comply with all the conditions of this Paragraph 3.1 as if the Notice and options hereinabove referred to had not been given and received. (e) Notwithstanding the giving by Landlord of its consent to any assignment or sublease with respect to the Premises, no assignee or sublessee may exercise any expansion option, right of first refusal option, or renewal option under this Lease except in accordance with a separate written agreement entered into directly between such assignee or sublessee and Landlord. (f) Tenant agrees to pay to Landlord on demand one-half (1/2) of reasonable outside attorney's fees incurred by Landlord, plus, to Landlord, a $500.00 review fee, in connection with any request by Tenant for Landlord to consent to any assignment or subletting by Tenant. (g) As a condition to any assignment or subletting of all or any portion of the Premises, that there not be an event of default under the Lease in existence at the time of Tenant's election to so assign or sublet or as the effective date of such assignment or subletting. (h) If, with the consent of the Landlord, this Lease is assigned or the Premises or any part thereof is sublet or occupied by anybody other than Tenant, Landlord may, after default by Tenant, collect rent from the assignee, subtenant or occupant, and apply the net amount collected to the Base Rental and additional rent herein reserved, but no such assignment, subletting, occupancy, or collection shall be deemed (i) a waiver of any of Tenant's covenants contained in this Lease, (ii) the acceptance by Landlord of the assignee, subtenant, or occupant as Tenant, or (iii) a release of Tenant from further performance by Tenant of its covenants under this Lease.